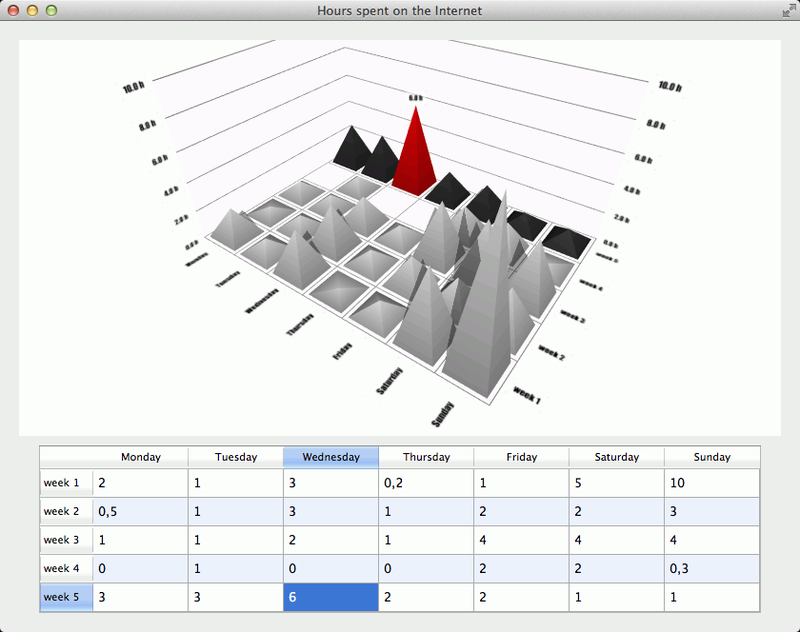 The table widget is going to be used to display the numerical data being inserted into the graph, and to modify it (See Adding data to the graph and Interacting with the data). // into rows and columns, so we simply set useModelCategories property to true to utilize this. Here we tell the proxy to directly map the model's rows and columns into the proxy's rows and columns instead of defining row and column roles to map for them. Then we give the model from the table widget to the proxy. We also create a series instance and set the proxy to it. We customize the series visuals a bit by changing the object mesh to pyramids, and finally add the series to the graph. First we set bar thickness ratio to 1.0, which means bars will be as wide as they are deep. 1.0 is also the default value, so the line is basically unnecessary. It's left there so you could easily try how changing it affects the graph. The second line sets bar spacings to 0.2, which means there will be a gap of 20% of the bar's thickness between the bars in both directions. We want to be able to select rows of data for a closer inspection, so we set the selection mode to slice item and row. This means that whenever we select a bar in the graph, the whole row will be displayed separately and the selected bar will be highlighted. We don't want to use the default colors, so we set one of the predefined themes as the active theme. Next line sets the font to Impact. If your system doesn't have it, it will be replaced by the system default. And finally, we set the camera position to one of the predefined camera positions. Now the initial graph settings are done. Note: You do not need to set any of these in case you're happy with the defaults. You can easily try them by commenting out the contents of the constructor. The main thing start() does is set up the data model. It also activates a timer for getting the accurate dimensions of the table widget after it's been filled with data. The reason we do this is that the widget doesn't know its final visual domensions until all the data has been inserted to it and it has been shown. The data timer usage is not vital for the application, so we won't take a closer look at it. It's just there to make QTableWidget look better. Now we have a bar graph and a table widget, both displaying the same data. We created QItemModelBarDataProxy instance, and gave the proxy the model of the table widget we just created. The proxy maps the rows and the columns in the model of the table widget into rows and columns for itself directly, as we set the QItemModelBarDataProxy::useModelCategories property to true, and the graph gets the data to be displayed via the series that owns the proxy. Now we'll find out what these were for. 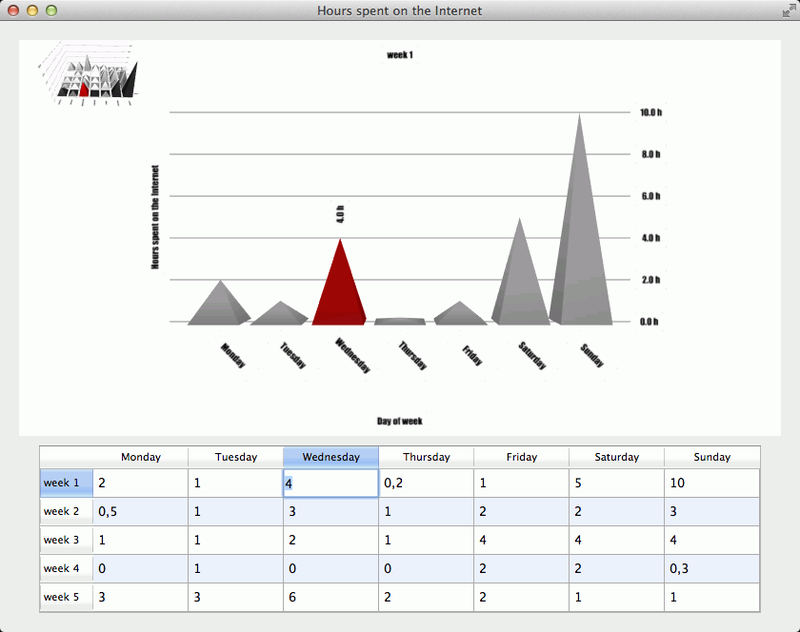 You can even select an item in the widget and change the value of it, and the new value is updated to the graph. This is handled again by the proxy with mapping between the data in the table widget and itself.